The industry's best-performing stock has gained a whopping 74% as the year comes to a close -- and the runner-up is up 64%. Get the latest 3D Systems stock news and facts. 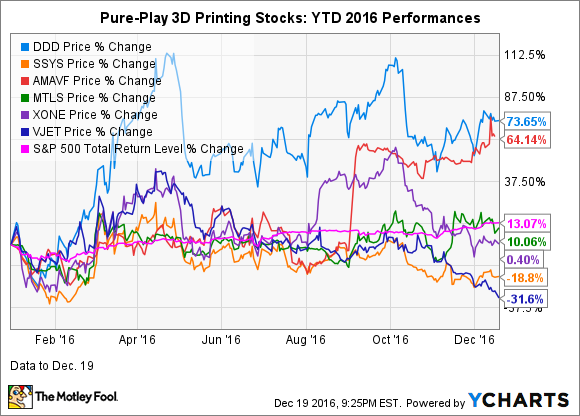 As 2016 comes to an end, it looks like the industry's largest player, 3D Systems (NYSE:DDD), will be the best-performing 3D printing stock this year. It's up nearly 74% as of Dec. 19. 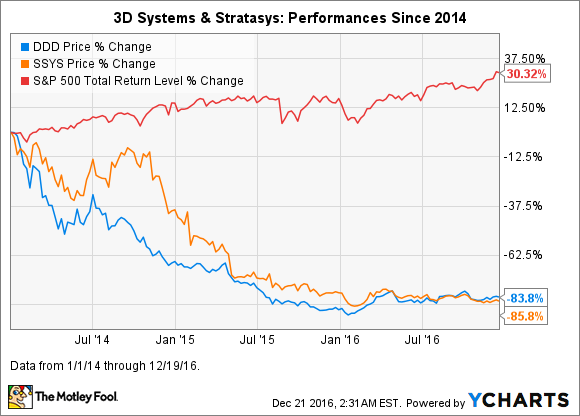 3D Systems is the best-performing 3D printing stock of 2016 to date. Data by YCharts. Moreover, unless something cataclysmic happens in the next eight trading days, 2016 will mark the first year since 2013 that 3D Systems has closed in the green; 2014 and 2015 were train wrecks for almost all of the 3D printing stocks, especially 3D Systems and fellow industry bigwig Stratasys (NASDAQ:SSYS). So while the group's performance as a whole is far from the heady years of 2012 and 2013, there is some 3D printing stock momentum as we head into 2017. Before we discuss why 3D Systems stock is having a great year, investors should remember that it's still far off its all-time high. Here's the picture since Jan. 1, 2014 (the 3D printing stocks hit all-time highs in very late 2013 through very early 2014), with Stratasys included for context. The chart below shows the big picture. 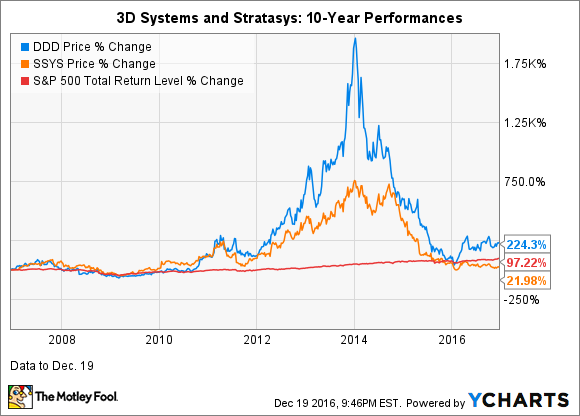 Despite getting clobbered in 2014 and 2015, 3D Systems' stock has still outperformed the broader market by more than a factor of two over the 10-year period, though Stratasys has significantly underperformed the market over this period. Why Is 3D Systems' stock up big in 2016? Investors should be very clear about this point: While 3D Systems' stock is up big in 2016, the company's business is still struggling. Since early 2015, 3D Systems -- along with Stratasys and some of the other players -- has struggled to grow revenue amid a widespread slowdown in demand for its enterprise 3D printers. The struggle at the top line has flowed through to the bottom line, leading to earnings losses on a generally accepted accounting principles (GAAP) basis throughout 2015 and 2016. The third quarter was the first time since Q2 2015 that revenue increased on a year-over-year basis. While this increase was a modest 3.2%, at least it halted the year-over-year revenue declines. In the second and third quarters of 2016, the earnings losses on a GAAP basis narrowed from the year-ago periods. Moreover, adjusted earnings in both quarters blew by Wall Street's estimates. Another likely reason the market has been more optimistic about 3D Systems this year is the change at the top. The market was likely satisfied with the choice of Vyomesh Joshi -- who came on board in April -- as the new CEO, since he has relevant big-company experience: He was a top 2D-printing exec at the former Hewlett-Packard before it split into two companies. However, in my view, the exit of the previous CEO was a much bigger reason for the market's optimism. Avi Reichenthal, who left late last year, had taken 3D Systems on an acquisition binge for the few years previous to his departure, which likely resulted in not enough resources being devoted to nurturing the company's existing businesses. I think it's likely that many market participants viewed Joshi's shake-up of the C-suite positively because the company has long had a poor corporate culture, according to Glassdoor ratings. Within a few months of being named CEO, Joshi replaced the previous CFO with a former finance colleague at Hewlett-Packard. He also apparently let the COO and CMO go; neither of those positions has been filled. 3D Systems completely exited the desktop 3D printer market -- mainly aimed at consumers and professionals -- in the third quarter. The desktop market is generally a lower-margin business than the enterprise business, and competition is fierce, which means there will likely continue to be major pricing pressures. So this seems like a good move. Early in the year, 3D Systems introduced Figure 4, a development-stage new tech geared toward manufacturing applications. This is a robotic, modular, stereolithography (SLA) 3D printing tech that the company touts as 50 times faster than conventional SLA technology. Joshi said on the third-quarter earnings call that Figure 4 is at least two years away from commercialization. Things are looking brighter for 3D Systems in 2016 than they did in 2015. However, investors should remain cautious, as the company is still struggling to grow revenue due to tepid demand for its enterprise 3D printers, and earnings on a GAAP basis remain negative.